Scrub and dice the potato. Smash to peel, then roughly chop the cloves of garlic. Wash and halve the tomatoes. Toss the potato, garlic, and tomato in a baking pan with olive oil, salt, and pepper. Roast until nicely browned, about twenty minutes or maybe longer because of the tomatoes giving off liquid. Meanwhile, bring the quinoa and water to a boil in a small pot. Reduce heat to low and cook for 15 minutes. Turn off the heat and let it stand. Roughly chop the basil. 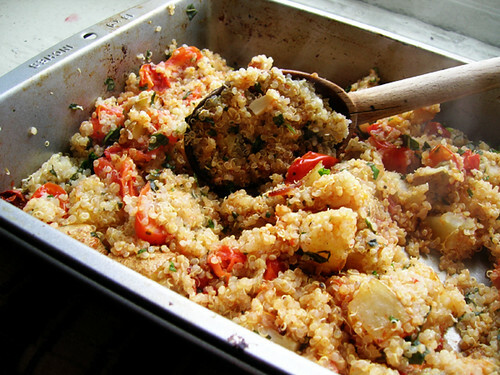 When the vegetables are roasted, add the quinoa and basil right to the baking pan and stir it all together.